(Nanowerk News) Battery charging is one of the major limits to the large-scale spread of electric vehicles. The research carried out in the last years has led to a rapid increase in the batteries performance extending the range of electric cars up to some hundreds of kilometres. On the other hand, battery charging still requires quite long times during which the vehicle must be stationary and connected to the charging station. This does not create problems for an urban use of the electric vehicle where the battery can be charged during the night. Things become critical if you plan a longer trip. The necessity of frequent and long stops would make the trip extremely uncomfortable with a constant anxiety about the possibility that the battery has insufficient energy to reach the destination. A prototype developed by Politecnico di Torino, named POLITO Charge While Driving, aims to solve this problem with a completely innovative charging system: cars can be recharged while traveling on highways equipped with dedicated systems that allow battery charging while the vehicle is moving. This would eliminate the stops for the recharge allowing the possibility to reach the destination with the battery even more charged than when the trip started and ready for use on secondary roads where the system is not installed. Hence, this system would even reduce the volume and capacity of batteries when a certain network of roads and highways is equipped. This system has been developed by the group of electrical engineering of the Department of Energy of the Politecnico di Torino, coordinated by Professor Paolo Guglielmi and Professor Fabio Freschi, composed of young researchers Vincenzo Cirimele, Michela Diana, Riccardo Ruffo, Alessandro La Ganga and Mojtaba Khalilian in cooperation with Centro Ricerche Fiat and Tecnositaf. 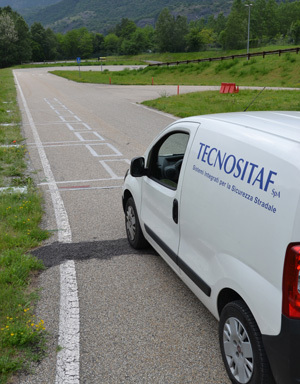 It is going to be tested on the test circuit in Susa close to the city of Turin. This test site has been developed in the framework of a research initiative promoted by the Politecnico together with 24 international partners of the European project FABRIC (Feasibility analysis and development of on-road Charging solutions for future electric vehicles). The prototype is based on a technology called Inductive Power Transfer (IPT) that is attracting the attention of many automotive companies and is seeing the development of several prototypes around the world. These systems work thanks to the inductive transmission of electric energy through the use of resonant inductors. The principle is similar to that one which allows us to cook on the induction cooktops. This technology, therefore, does not require any electrical contact introducing many advantages in terms of safety and ease of use. It strongly reduces the maintenance needs, eliminating external installations such as charging columns, which are often subject to accidents or vandalism. A further step with these systems has been made through the prototype installed at Susa, which does not require that the charge has to be carried on a stationary vehicle during stops or during parking: this application, called dynamic IPT, is based on the same technology extended during vehicle movement. The basic unit of an IPT system for automotive applications consists of a fixed coil, placed underneath the road surface, designated as a transmitter, and a coil installed on the vehicle, called receiver. In the Susa test circuit, 50 transmitting coils have been installed, which will send power to a receiver installed on a light commercial vehicle. In the short term, the diffusion of the dynamic IPT would completely eliminate the need for recharging stops and greatly reduce the capacity of batteries installed on board the vehicle. In applications on fixed routes, such as public transport, the use of dynamic IPT could lead to almost total elimination of batteries whose presence would be due solely to backup reasons. The development of these systems is therefore exciting challenge for electrical engineering and could be a decisive turning point for the diffusion and development of mobility based on alternative sources to fossil fuels.